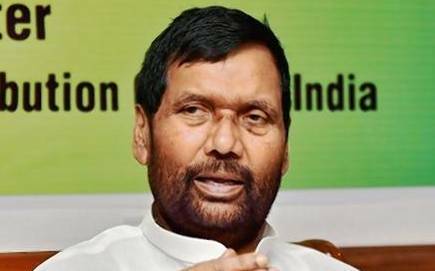 New Delhi: Concerned over rising cane arrears to farmers, Union Food Minister Ram Vilas Paswan Tuesday asked states to take stringent action to ensure sugar mills clear over Rs 20,000 crore outstanding payment to farmers at the earliest. Paswan has written to chief ministers of all sugar producing states, including Maharashtra and Uttar Pradesh, in this regard. The Centre last week raised the benchmark price of sugar sold at factory gate to Rs 31 per kg from Rs 29 per kg earlier. “Cane arrears are rising. We have taken up this issue very seriously. We have written a strong letter to all chief ministers of sugar producing states. We informed them that the central government is taking every possible steps but ultimately the responsibility lies on states to ensure that sugar mills make payment to cane farmers,” Paswan told PTI. States should take whatever action is required to ensure farmers get their outstanding amount, he added. Paswan said the states want the Centre to do everything, even as the onus lies on them to ensure timely payment to farmers. “I am personally talking to Uttar Pradesh Chief Minister on this issue. I have also asked union food secretary to regularly hold video conference meeting with states’ cane commissioners to monitor the situation,” he said. Last week, Paswan had informed that cane arrears reached Rs 20,167 crore till February 13 this year. Out of this, arrear on the basis of FRP (central price of sugarcane) is about Rs 18,157 crore. Cane arrear is highest in Uttar Pradesh at Rs 7,229 crore, followed by Maharashtra at Rs 4,792 crore and Karnataka at Rs 3,990 crore till February 13 of the 2018-19 marketing year ending September. In the last few years, the government has taken several measures to help cash-starved mills clear cane dues. These include increase in import duty on sugar to 100 per cent, scrapping of export duty, creation of buffer stock, and subsidy for mandatory export of 5 million tonne in the current marketing year. The Centre is also giving loans at subsidised interest rates for setting up of ethanol capacity. As per the Indian Sugar Mills Association (ISMA), sugar production rose eight per cent to 185 lakh tonne in the first four months of 2018-19 marketing year. The production, however, is estimated to decline to 307 lakh tonne during the year from record 325 lakh tonne in 2017-18 marketing year.